Pickerel Lake Pathway is an easy, 2-mile loop that encircles the lake, staying within sight of the water for much of the hike. Although at times you’re hiking through matchstick forests of aspen and even an old clearcut, in the beginning the pathway skirts an interesting cedar swamp and at the north end of the lake winds past pines large enough to make any botanist pause and look up. Pickerel Lake Road is one of the most interesting roads in the Pigeon River Country State Forest. 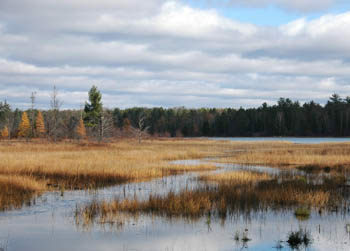 It departs from the paved Sturgeon Valley Road and climbs through a deep woods before breaking out at a scenic pull-off. Topping off at 1,080 feet is a bench with an impressive view of forested ridges and hills for miles. From there it’s a straight drop down to the Pickerel Lake State Campground that will have anybody riding shotgun gripping the dashboard while you’re worrying about the trailer you’re towing. It’s great introduction to this state forest campground. Pickerel Lake is the most popular place to set up camp in Pigeon River Country because it’s the largest facility, featuring the best swimming, some interesting fishing opportunities and serves as the trailhead for the Pickerel Lake Pathway. Combine them all and you have a wonderful destination for the weekend. Maps often show a trail that connects Pickerel Lake Pathway to Green Timbers but keep in mind that this route is poorly marked and very hard to follow. The pathway is posted on the south side of the boat launch parking area and from there heads around the lake in a clockwise direction. You begin by treading between the stand of cedar that borders the shoreline and a low bluff and in between everything is carpeted in soft green moss. The pathway however is not. The trail crosses the bridge and follows the west side of the lake for a spell, staying within sight the water. 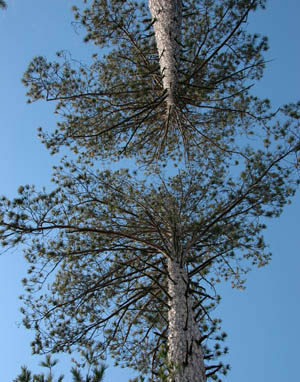 At Mile 1.2 you swing into the woods near the north end of the lake and pass a handful of impressive trees, particularly red and white pine. After passing through an old clear cut, you re-enter a more pleasing forest and then pop-out in the campground, across from site No. 13 at Mile 1.8. 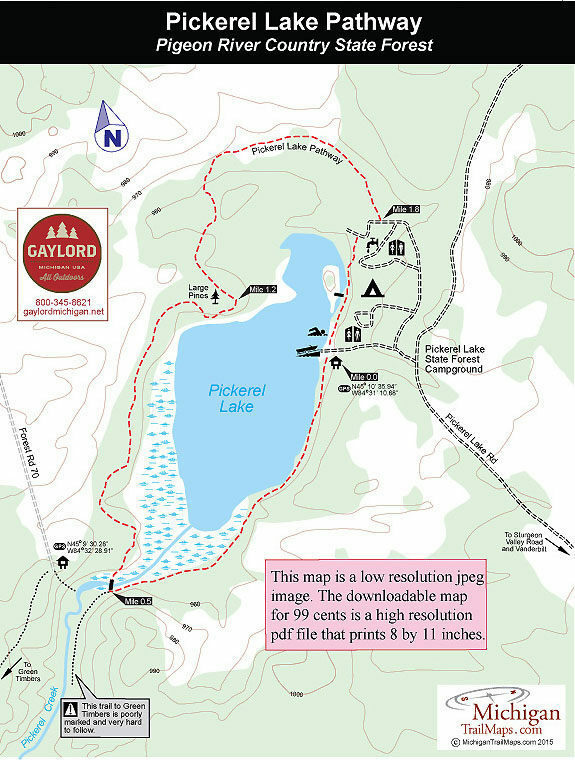 Head right and follow the campground road briefly to pick up the trail as it skirts Pickerel Lake and its day-use area before returning to the boat launch at Mile 2. The north shore of Pickerel Lake was a camp for the Civilian Conservation Corps during the 1930s. Today it is a rustic campground with 39 sites, vault toilets and hand pumps for water. There is no beach on the lake but a grassy area serves as one while the water here is shallow for 30 or 40 yards with a sandy bottom. The campground also has an unimproved boat launch with limited parking for a handful of vehicles. Pickerel Lake is completely undeveloped and has a ban on boat motors other than electric. From I-75 depart at exit 290 and in the town of Vanderbilt head east on Sturgeon Valley Road. Ten miles from Vanderbilt turn north (left) on Pickerel Lake Road to reach the posted campground entrance in 2 miles. For additional information stop or call the Pigeon River Country State Forest Headquarters (989-983-4101), an impressive log lodge on Twin Lakes Road.